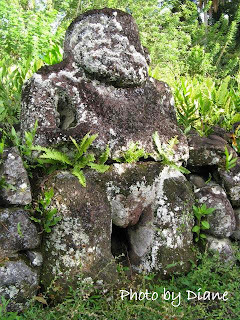 We revisted two previous islands: Nuku Hiva and Ua Pou. These were more relaxed days as the only thing on the agenda for passengers was wandering around town, visiting handicraft centers, and just taking it easy. We set sail that afternoon for another day and a half at sea. 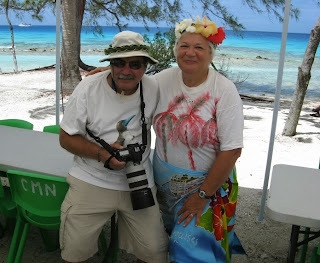 Our final port of call was Rangiroa, another atoll in the same group as Fakarava. 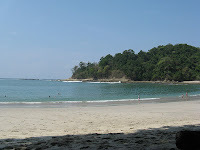 Our day here was another relaxing one, with a fascinating visit to a pearl farm and beach bar-b-q and swimming. At the pearl farm we learned about the oyster used (black-lipped) to create the black pearls, how the oysters are seeded and how they are harvested. BTW, although the pearls are all referred to as black, they come in many shades, from gray (like in the picture below), through blues and greens, all the way to pitch black. There was plenty of time, of course, to also spend in the farm's small boutique where a bunch of pax (including myself) did some shipping. Prices were very good. The rest of the morning and the afternoon were spent on the beach. I learned how to make the flower tiara I'm wearing, we had a delicious bar-b-q lunch, and then I swam in the warm, turquoise water. Perfect day! We docked back in Papeete around 8 a.m. We had another two days on Tahiti. Our original plan was to fly out that night. 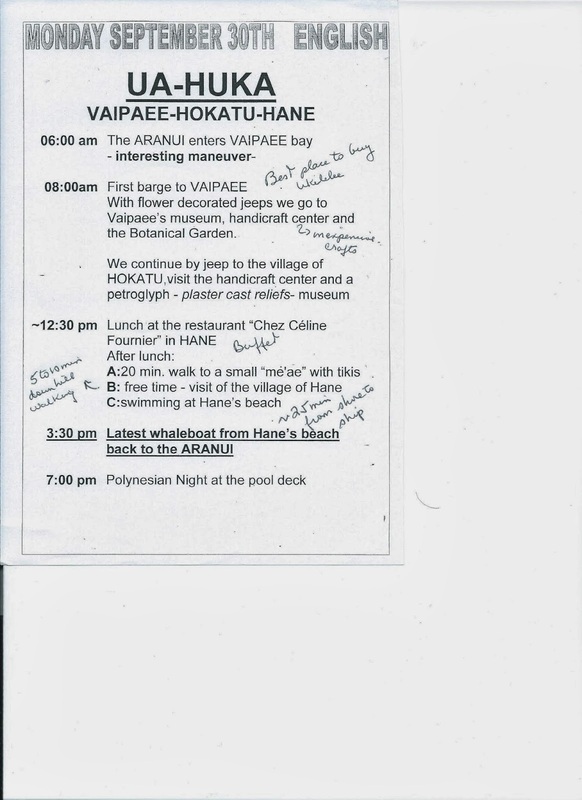 But the documents from Aranui make it very clear that there is no guarantee the ship will be able to keep to its original schedule. So, to be safe, we made arrangements to fly out the following night. We spend the day relaxing, a strolled into downtown for the Internet cafe and some final shopping. Lunch was at a nearby pizzaria and then we picked up stuff for dinner to eat at our hotel. 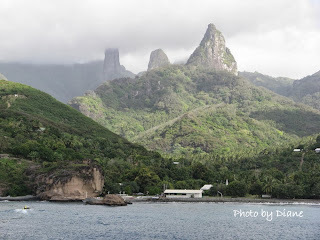 We drove clockwise around Tahiti Nui. 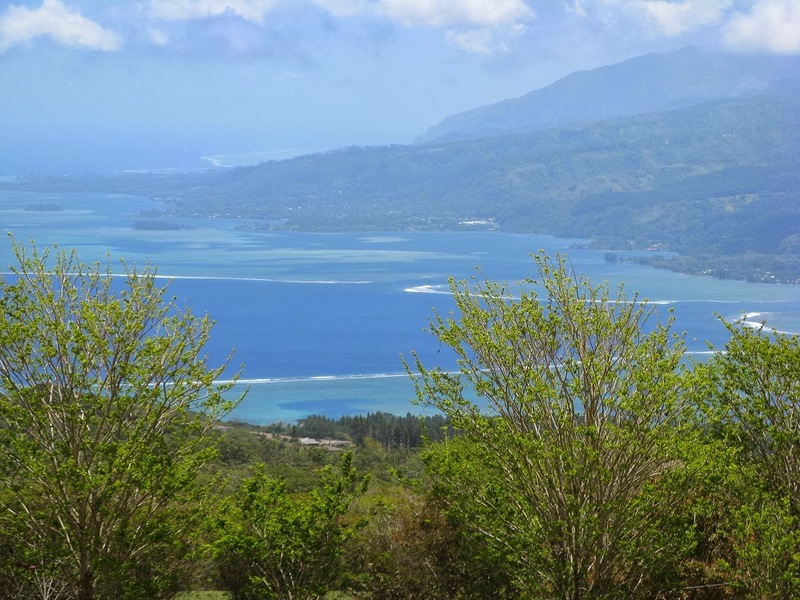 Once out of Papeete, traffic was light and driving was very easy. 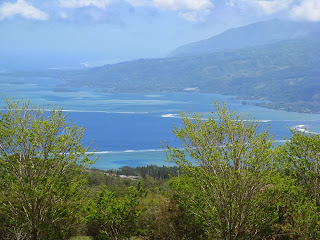 We made it to Tahiti Iti and found the road to take us up to an area where we could look over the straight to Tahiti Nui. What a fantastic view. It was a long, tiring day but it was nice seeing more of the island. Back at the airport, we headed to the upstairs restaurant which had air conditioning, unlike the open air downstairs restaurant. Like many international airports we have been to, agent gates do not open until about 3 hours before flight time and, without boarding passes, could not get into the airport terminal. BTW, weight limit for carry-ons for Air Tahiti Nui is 10 kilos and they are very serious about this. There are airline agents wandering around with baggage scales. I had to repack the suitcases because I wanted to carry one onboard. Interesting though that no one bothered to check my back pack where I transferred the weight ... until I got into the terminal. And then I threw it all back into the suitcase. 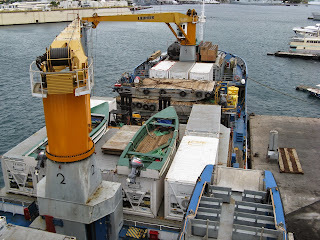 We were finally able to watch some of the loading and unloading of freight while at anchor as we stayed in the harbor of Tahuata for about 2 hours. It looked like those bags of gravel we had seen previously were destined for this island. 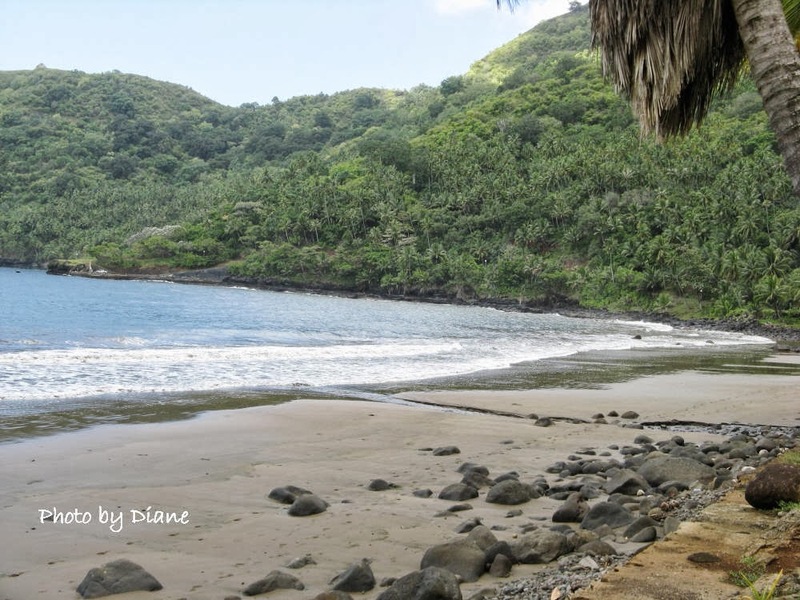 We then sailed onto the town of Atuona where we were docked and found trucks waiting to take us to the cemetery where Gauguin "may" be buried. Also buried at this cemetery is Jaques Brel who we learned was a very famous European actor. 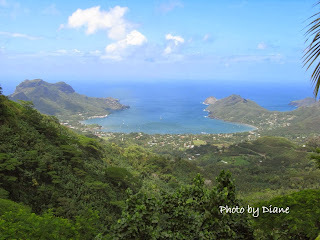 We took the truck ride to the cemetery but when we saw the incline of the hill to the graveyard, we decided to stay on the truck and get off at the Gauguin Cultural Center. There was a lot of information about Gauguin including his life, is style of art, the evolution of his work and many copies of his works. This was a quiet day. After lunch at a local restaurant we had time to wander around town, or if so inclined, there was a 1 hour mile hike up to a viewpoint. We chose to do our viewing at sea level. 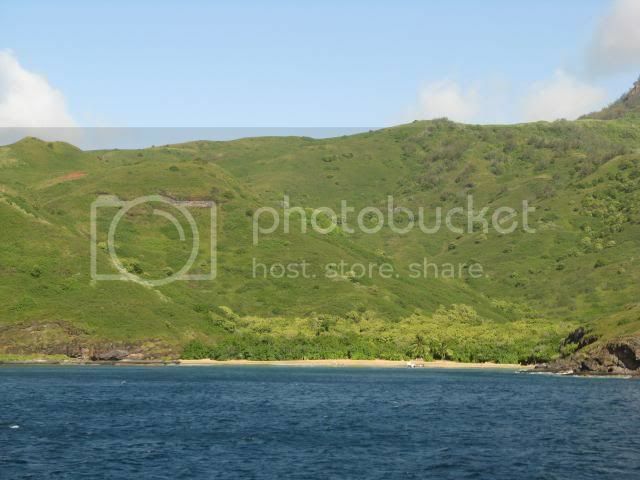 Fatu Hiva is the southernmost of the populated Marquesan Islands. 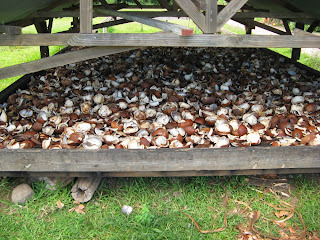 Here we had a demonstration on how they make tapa cloth and mono oil (fragrant coconut oil). As usual we were divided up into three language groups and we did find the demonstrations quite interesting. In making the tapa cloth, the bark is first removed from a tree branch (breadfruit, banyan or mulberry), then the inner part of the bark is removed. That is then folded and pounded and folded and pounded and wrung out and then some more, to remove as much water from the bark as possible. Then it is allowed to dry for a day or two before being decorated. Moistening the cloth again allows it to be used as cloth, such as in preparing the mono oil. Preparing the mono oil is another long and tedious process. 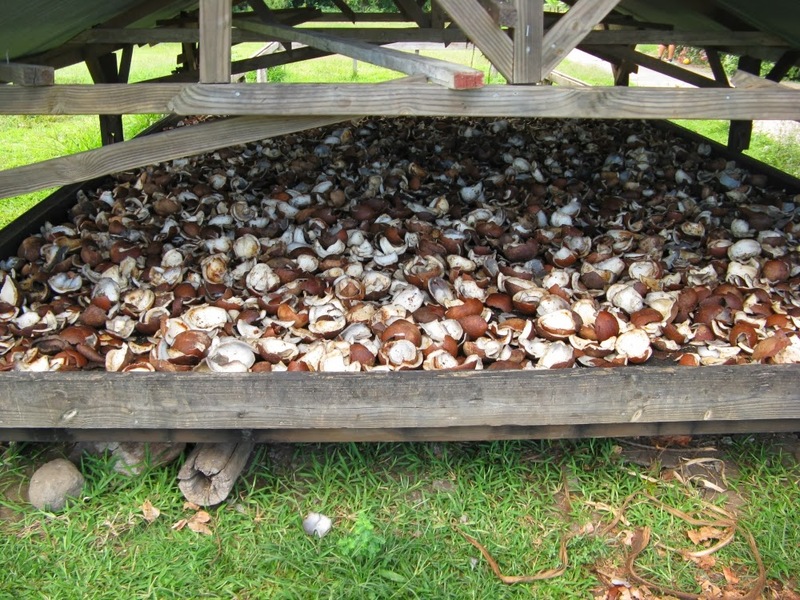 (I found it interesting that only a sprouted coconut is used for this.) The coconut is grated into a tapa cloth and then fragrant flowers are added. The cloth is then twisted and wrung out over a bowl, with the coconut oil mixing with the fragrant flower oils. This island was probably the most lush one we visited and, for sunset, we headed to the Bay of Virgins. 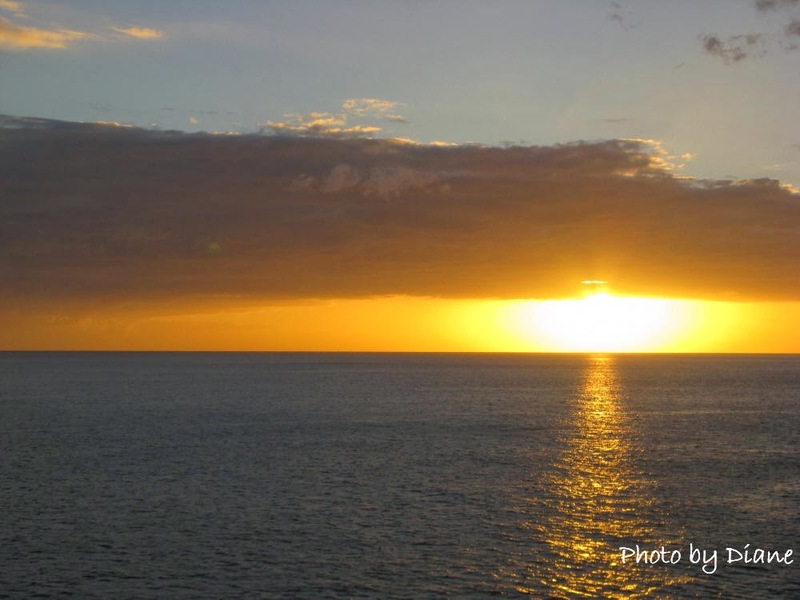 Several pax were fortunate enough to see the green flash during this sunset. (Here is the link to Part 1). 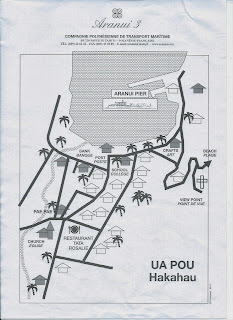 We docked in the village of Hakahau which made getting on and off the ship easy. The handicraft center was right on the beach and we had free time to wander the village. There was an exhibition of Marquesan art in the town hall and the Catholic church has some nice woodcarvings. 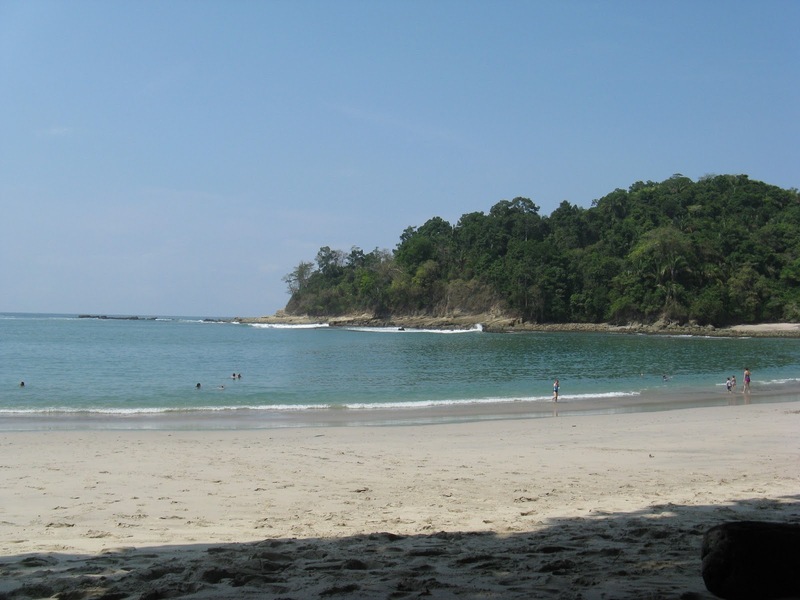 It was possible to swim at the beach here, and while others did, I didn't. While it looked nice, and we spent a bit of time walking the beach and wading ankle deep, I have this philosophy about not swimming in water that is part of an active port, which this was. Artwork here consisted of something unique .. rock art made from flower stone ... and I did buy a piece for a friend of mine. Lunch was on shore, a buffet at a local restaurant. It was within easy walking distance of the dock but if anyone felt they needed a ride, one would be arranged. 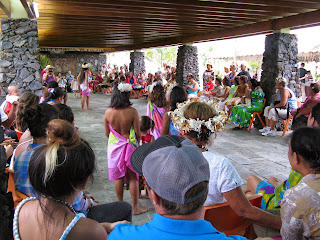 We were treated to a display of Marquesan dancing and then settled in to eat. 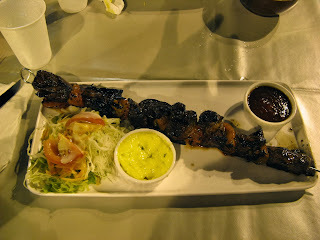 There was a wide variety of dishes, for everyone from the vegan to the carnivore. After lunch it was a stroll back to the ship. 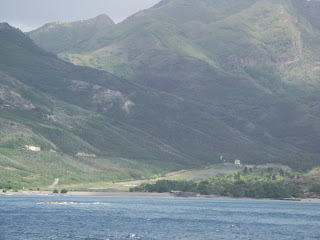 The Aranui changed anchorage in the afternoon, to the village of Hakahetau. It was nice just to stand at the ship's rail and take pictures of the beautiful changing landscape. This is a picture of the airport. Notice length of runway. We were told there wasn't much to see and do in Hakahetau... some crafts, hike to a viewpoint .... and also that disembarking and embarking the barge on the shore could be dicey. So we stayed on board (as did many people). I took advantage of the pool which is very nice when the ship is anchored and the water is not sloshing all over the place. 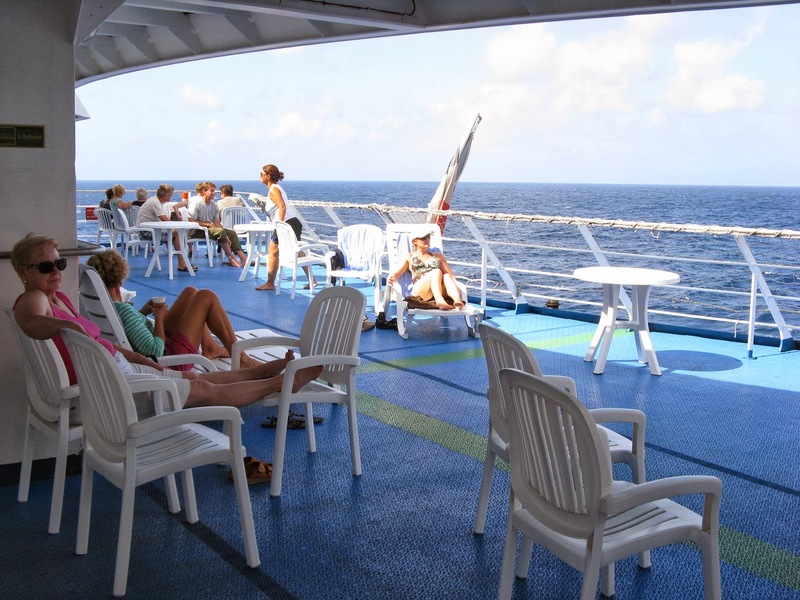 Many pax simply found a comfortable place on board to read, play cards or sunbathe. A combination of a head cold and a sick computer put me behind schedule. 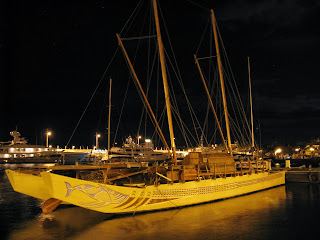 There will be more posts coming about our sailing on the Aranui 3. OK ... the part of my report that I am sure you have all been waiting for, as in "So how were the islands?" Briefly, the islands are beautiful. 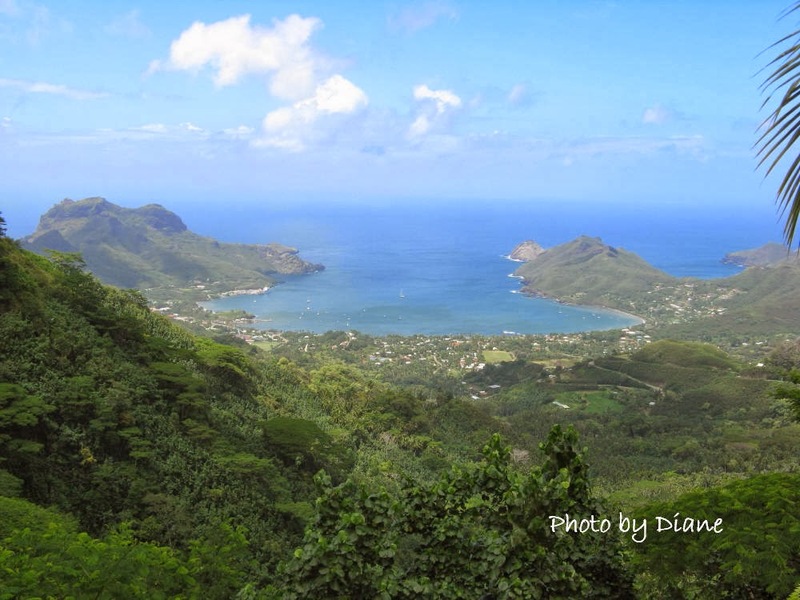 The Marquesa Islands are volcanic in nature, being the youngest geologically of all the islands in the chain that starts in southeast Asia. 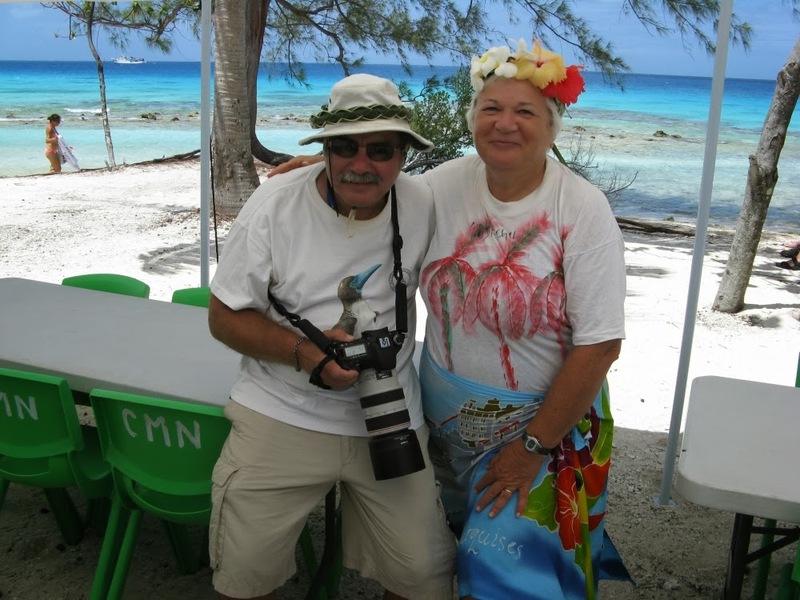 We visited two atolls in the Tuamoto Islands group that lies between Tahiti and the Marquesas: Fakarava (first island stop) and Rangoria (last island stop). 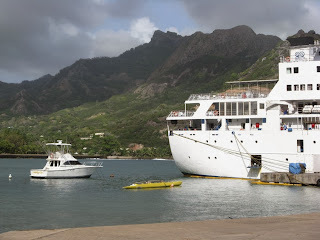 The rest of the time we spend sailing around the inhabited Marquesa Islands: Nuka Hiva, Ua Pou, Hiva Oa, Fatu Hiva, Tahuata, Ua Huka, and then back to Nuka Hiva and Ua Pou to deliver cargo picked up on the other islands. Fakarava is an atoll with about 600 residents. I would guess its highest point is about 15 feet above sea level. We had no cargo to deliver or pick up so why we stopped I'm not particularly sure. We had time to wander around, walking across the motu (island) from the lagoon to ocean side which took us all of about 10 minutes. 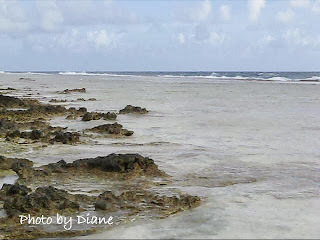 (An atoll is a ring of coral that surrounds a calm lagoon. However, the ring does not necessarily break the surface all the way around and the result is a string of small islands circling the lagoon.) The lagoon was very calm and the oceanside was protected by a shelf of coral. However, I'm sure I wouldn't want to be here during a hurricane (cyclone in this neck of the woods). We had time to wander around, look into whatever shops were open including a very nice pearl shop. It was Sunday and most shops were closed. We passed two churches, one holding a Christian Sunday service and the other where the singing was Polynesian. We had a day at sea and it rained most of it. 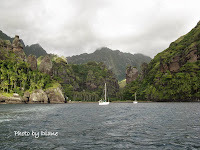 But the next day dawned clear when we docked on Nuku Hiva. Our stop was its capitol, the town of Taiohae. The dock was about a 25 minute walk to town or, for those that didn't or couldn't make the walk, there was a Le Truck (picture a wooden school bus with benches) to take us the distance. Perhaps because of the bad weather, we docked about 1 1/2 hrs late and things were a bit rushed. We were supposed to have time at the handicraft center in town and then board any of the four wheel drive trucks waiting nearby. With really no spare time, most pax went straight to the trucks while others (moi?) had to browse the handicrafts first. 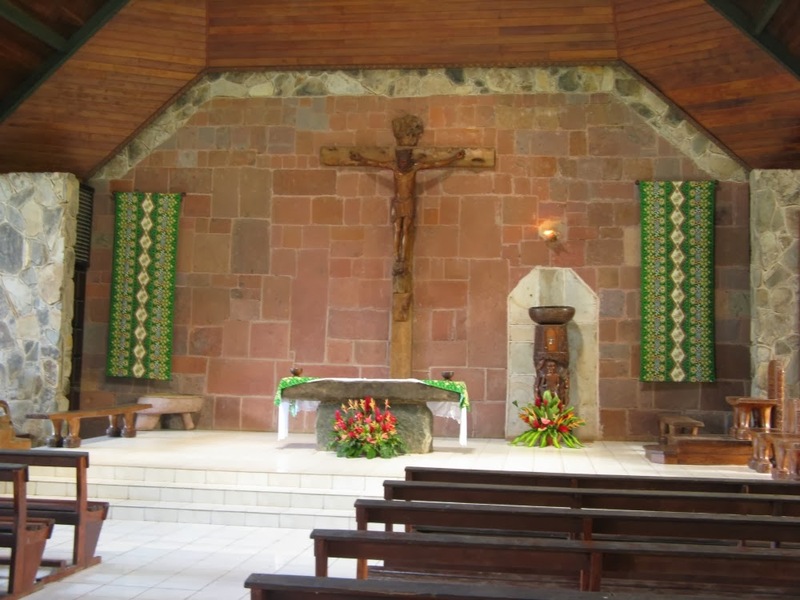 As each truck filled up with 4 passengers, it took off to visit the Cathedral of Taiohae. The pax were divided into three groups for lectures on the history of the church and of the missionaries in the area. Along a drive up the winding island road -- concrete in some areas and dirt in others, with the associated ruts and potholes -- we stopped at a couple of places for photographs. Of course the views were stunning and I would have loved to have pulled a chair out of the trunk of our vehicle and sat there with a drink in my hand. We were offered a beverage but it was simply bottled water. Back into our vehicles for a visit to the archeological site of Tohua Kamuihei. There we were entertained by dancers. Afterwards, we again split into groups and those that wanted could wander around the ruins. While there was a defined path, it was rocky and crisscrossed with tree roots so we decided to pass, saving ourselves for the after lunch "20 min walk uphill to the MeaePaeke" site. Lunch was a buffet, as all lunches ashore were. They were all handled very well, with multiple tables serving the same dishes so no long wait to eat. This particular stop was special as parts of the main course, such as the pig, goat, fish and some of the vegetables, were cooked in an earth oven. We got a chance to watch as the workers scraped off the dirt, peeled back layer after layer of burlap and then layer after layer of leaves, finally lifting the food out on a stretcher. 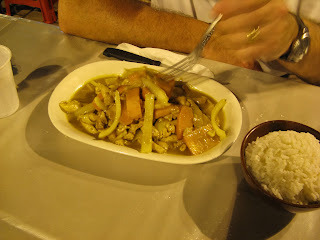 Some of the menu items included cold foods such as poisson cru, octopus salad, and shrimp salad, plus hot foods such as the roasted pork, fish, goat and vegetables. For the first time I had a chance to try breadfruit and cassava and liked both. Dessert was a banana pudding which was the most unappetizing looking dessert I (and a lot of other people) had ever seen. While it was tasty, most of us couldn't get past the appearance ... trust me ... you don't want the "image." We had options for after lunch: an approximately 40 minute hike to the saddle between two beaches, an approx. 20 min walk uphill to the archeological site, or swimming at the beach, if it was calm. We opted to visit the archeological site. This is where the brochure can use a rewrite. For us, it was grueling and we wished we had our hiking poles. It was uphill over rocks, roots and, in places, mud. By the time we got to the top, we were soaking wet, exhausted and very thirsty. While we found the site interesting, with barely uncovered walls and tikis, we were so busy recuperating from our hike that we didn't pay much attention to the lecture. In the end, after we visited another site (by vehicle) we really began to understand that all we were learning about Marquesan culture was really conjecture. 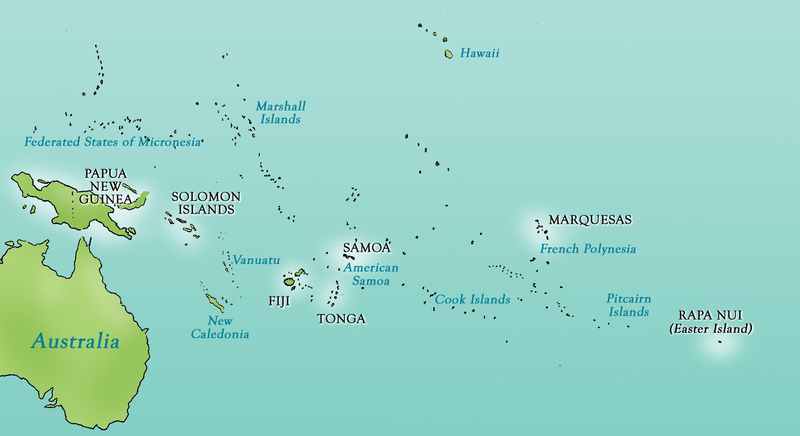 In 1888 Marquesan society came to an end, when all of the Marquesans were disarmed and the Church forbid the practice of any Marquesan culture. 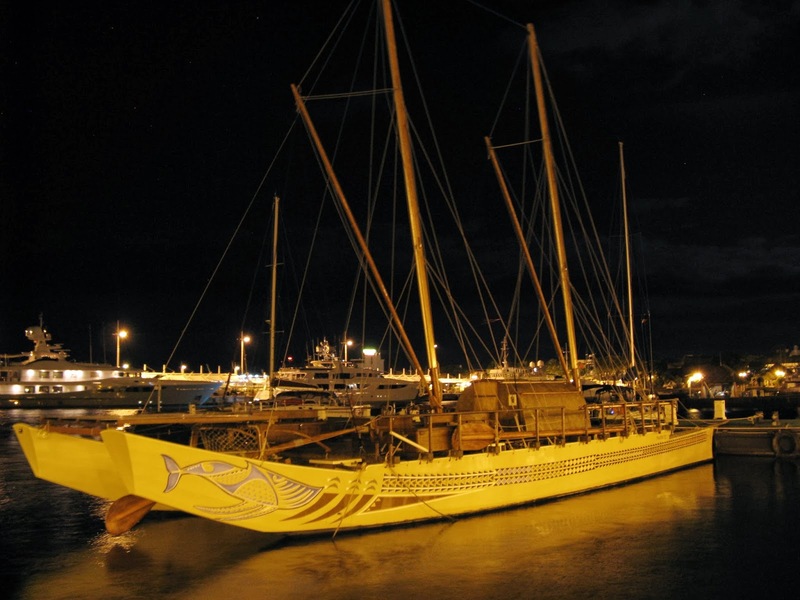 The Marquesan culture we see today is being reconstructed from the journals, logs, reports and artifacts found in museums around the world. During our time ashore, the Aranui 3 had moved anchorage. 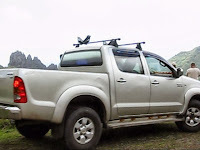 After hiking back downhill, we grabbed a bottle of water (provided by the Aranui) and got into our ride. Down more curving roads to a black sand beach and the barge waiting at the beach to tender us back to the ship. I was told clothing on board was extremely casual and it was. Also glad we brought clothes that we didn't mind getting sweaty, wet or muddy. We both had footwear that could get wet and we practically lived in them. Some pax had not only sandals that could get wet but also water shoes to wear in the water ... which turned out to be a smart move because most of beaches had rocks ..both on the beach and in the water. The Aranui brochure mentions "jeep" tours. 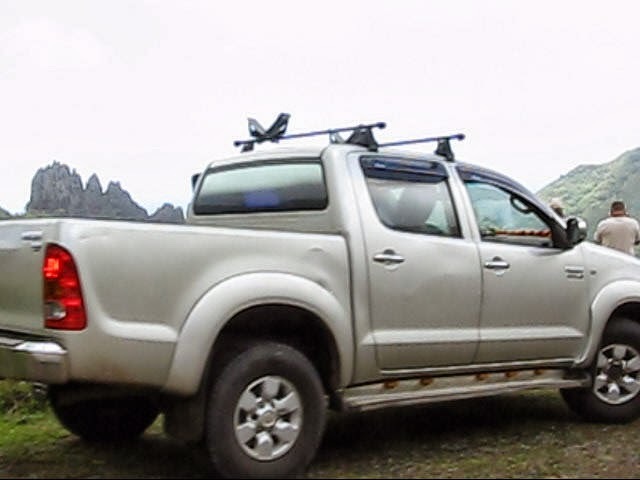 Actually these are 4-wheel drive pickup trucks that hold 4 pax each. I would guess that everyone on an island who owns one of these stops whatever they are doing and takes advantage of the additional income from providing pax transportation. What amazed us were the number of late model vehicles, like Dodge Rams and Ford Rangers. We learned that not only is the cost of the vehicle subsidized for Marquesa residents by the French government, but the loans for the balance have very friendly terms. I was sorry that I dragged my binoculars along. I knew this wouldn't be a place for bird watching but I thought maybe we'd see some ocean life like dolphins or whales. While we did see both, the experience was extremely brief. Anyone want a Polynesian tattoo? Here's your chance to get one. One of the crew members is a tattoo artist and, off the top of my head, I probably saw new tattoos on at least 10 percent of the passengers. The Aranui definitely serves an important purpose. As one passenger said, "someone has to deliver the mail." 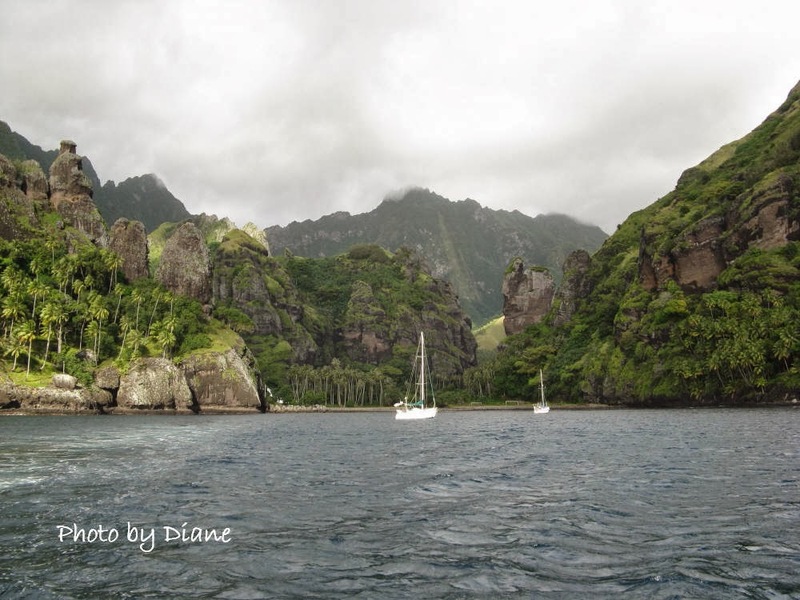 Cargo was not only delivered from the islands to Tahiti, but also island to island. For instance, we saw huge bags of gravel being loaded. They were coming from an island that had a quarry to an island that was building a new road. Open crates were filled with packages being sent from island to island and to Pape'ete ... when we arrived in Pape'ete, people were lined up at "ticket" windows to claim packages they were waiting for. On our first day we had a safety meeting and a lifeboat drill. 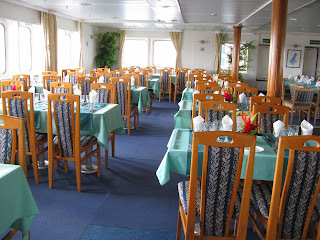 In the afternoon we had our "Life on Board" meeting, where I learned some things I wish I had known earlier, like the request-a-meal in the dining room. We also received a brief rundown about the islands we would be visiting, what we would do there and what crafts were the best to buy there. I took notes and I'm glad I did as having a clue about what lay ahead was very helpful to us. For instance, if we knew the next day would have an excellent beach for swimming and relaxing, we pushed ourselves physically on the current day. Basically our day was breakfast (served 6:30 to 8:30), barge to shore and then lunch either on board, at a local restaurant or a beach BBQ. 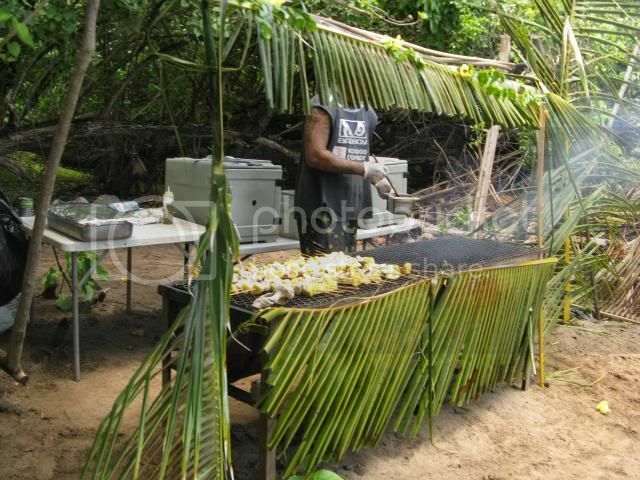 Typically if we had lunch ashore, there were options for the afternoon such as hiking, shopping or swimming. If lunch on board, it could be because we were docked and pax could come and go as they pleased. Or we would weigh anchor and head to another island. Some afternoons we had a lecture. Our on board lecturer was Michael Koch and we thoroughly enjoyed listening to him. Other afternoons were a movie such as National Geographic's The Lost Continent of the Pacific. One afternoon we had a drum lesson. That's me on the right. Generally, back on board was anywhere from 3:30 to 5:00. At 6:00 pm (if you got to the lounge early enough, you might find some leftovers from the cookies put out around 4:30) we had our meeting about the next day where we learned about the island we were visiting, received the day's agenda, saw slides about where were going and what we were doing, and had a chance to ask questions. If appropriate we would also be given a map. Samples of both are below. Dinner was at 7. While the Aranui Band played at the bar after dinner, and there was karaoke some nights and movies other nights, we were in our cabin by 8:30 and asleep by 10. 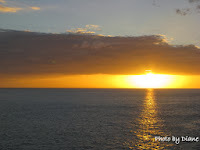 I left off on Onboard the Aranui 3 Part 1 promising more about getting to and from shore. It turned out to be a lot more difficult than we anticipated. We were given specific instructions over and over to follow the crew's direction. We were also entertained with horror stories about pax who did their own thing and got either very wet, or even worse, hurt. 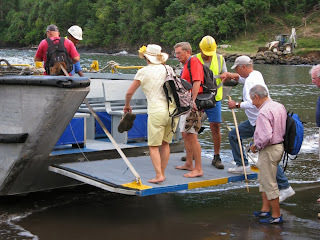 Concrete steps when embarking and disembarking barge. Remember that the pax barge is moving up and down with the waves. So..... back to life on board. Which brings me to our fellow passengers. Not surprisingly, most were French. I think the number of English and German speaking pax were about the same. We met a lovely couple from Switzerland, another from New Zealand, and a gentleman from Germany who is traveling around the world. We had very little interaction with the French pax and what we did have was mostly unpleasant (although one very nice couple loaned me their water shoes so I could go into the water on a rocky beach). I felt that early communication of information to passengers could be better. For instance, we had two bottles of water in our cabin and I went to the Reception to find out if there was a charge. They were free and I was told to refill them at the water fountains around the ship. Do not to drink the water from the tap or the shower. Would have been nice if there had been a sign to that effect in the bathroom! :( Also, I didn't find out until latter that I could make a special meal request. Actually, the brochure does specify letting the company know if you have any dietary restrictions. I don't have any "restrictions" so didn't think to say anything. However, I don't like fish and when the lunch or dinner choice is take it or leave it (and the take-it is fish), I'm not a happy camper. Yes, there is absolutely no choice once you sit down at lunch and dinner. So after speaking to Reception and then again to the woman in charge of the dining room, I got chicken or beef whenever fish was served. It didn't turn out to be a big issue but I wish I had known for that first night on board when the main course was fish. Tables in the dining room were set up for 4, 6 or 8. Tables for 4 had one pitcher of water and one bottle of wine. Larger tables had at least two of each, the wine one white and one red. We sat at a table for 4 and only had the luck of the draw whether we had a bottle of white or red. We soon became friends with whoever sat at the 4-person table next to us (who had the other color wine) and we shared back and forth. Dining room service was excellent, friendly and efficient. The food ranged from stuff I couldn't eat (tuna tartar - pass an extra piece of bread, please), to very good to excellent. To the best of my knowledge, nobody went hungry. Just want my subscribers to know that my posts about our trip to the Marquesas have pictures and video in them. If you don't see any images when viewing my post (such as in your email account), click on the title to be taken to the original post on the blog. 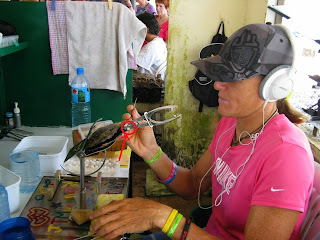 I've been trying to decide how to post the information about our trip. I took all kinds of notes. Some had to do specifically with the ship and the cruise. Other notes had to do with the specific islands. The notes are day by day and I have, in the past, posted our day-by-day activities. But on this trip a lot of the day-by-day happenings were the same. 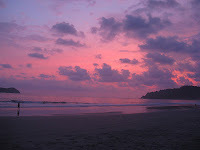 For instance, we had a meeting every evening about the island we would be visiting the next day. 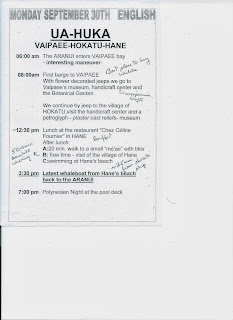 Somehow I think reading daily reports that included "6:00 p.m. Meeting about tomorrow's island" would run stale pretty fast. First, I need to say that this cruise was not what I expected. I had hoped for lots of opportunities to watch the ship "work," loading and unloading cargo while anchored in the harbor. We could not do this AND take advantage of the planned excursions ashore. Yes, we had some time to watch early in the morning before the first pax barge went ashore. But the majority of the work was done while we were away. Additionally, there was really no good place to stand and watch the crew at work. 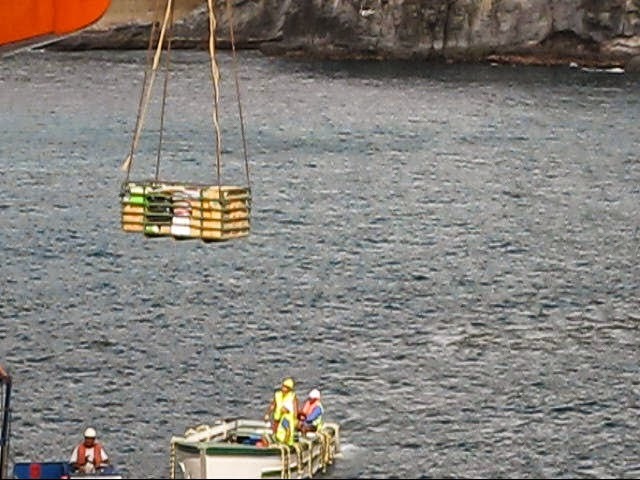 While there were two suitable areas for watching (both accessible by outside stairs), pax were shooed away - for obvious safety reasons - if they were too close to the cargo being loaded and unloaded. The other thing I didn't expect was how physically difficult this trip would be. I reread the brochure a couple of times to see what I missed. The fact is I didn't miss anything. The brochure could use a re-write. 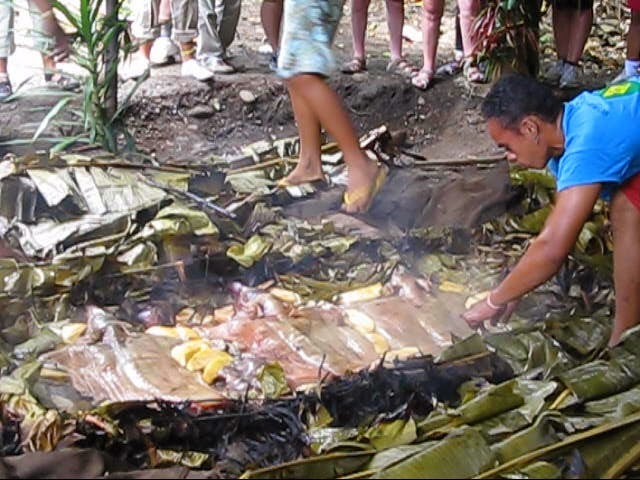 For instance, the brochure says that after lunch on Nuku Hiva we "will travel to the valley of Taipivai. 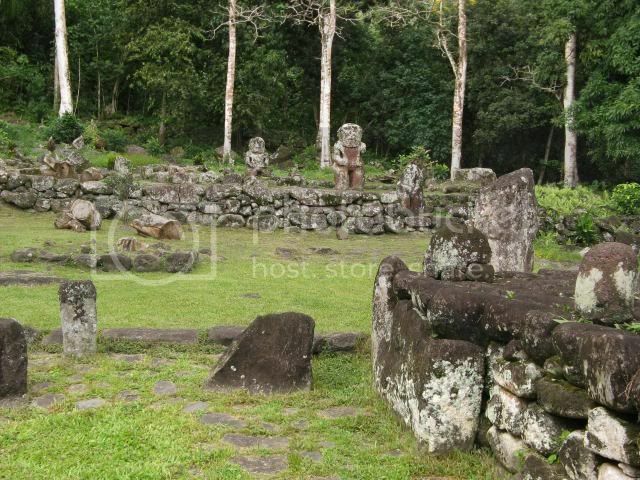 The area is dotted with stone tiki gods and sacred ritual sites." What the brochure doesn't tell you is that to see the archeological site, you have a 20-30 minute uphill hike. Fortunately I found broken branches that we could use as hiking sticks. I wished we had brought our hiking poles and many other pax felt the same way. Between the steepness of sections of the "walk" and the heat, we were exhausted and dehydrated (yes we had water with us) by the time we were done. The other part that could be difficult was the boarding and disembarking the pax boat. We walked down the gangway and instructed to step onto the black platform at the bottom. From there we were assisted aboard the pax barge. 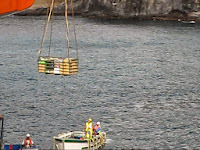 The video below shows how it works in calm seas. Now imagine doing this in water not quite so calm. There were times the black platform at the bottom of the gangway was a foot or more underwater (YES! underwater) while the pax boat was on the crest of the wave, with the barge entrance 3 to 4 feet above the platform. We soon learned not to time the transfer ourselves but, instead, to leave it up to the very experienced crewmen who would sometimes launch us onto the barge. They knew what they were doing. No one fell. No one got hurt. It truly was an experience. Our other embarking and disembarking experiences? This was on Yahoo! travel. GREAT hint! 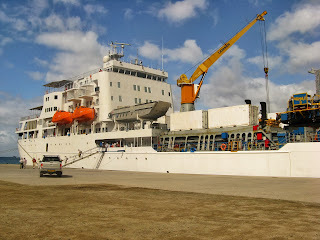 The Aranui 3 is part freighter part cruise ship. Her maiden voyage was January 2003 and she shows signs of having sailed the seas for 10 years. She has rust spots and could use a new coat of paint. But time in dry dock will probably not happen as the Aranui 5 is due to sail in 2015. The Aranui is owned by a Chinese family. (That is why there is not going to be an Aranui 4 because 4 is an unlucky number to the Chinese.) While the carrying of freight between Pape’ete and the Marquesa Islands is subsidized by the French government, the really profitable part of the business is carrying passengers. Each new Aranui has been capable of holding more passengers. There was no confirmation yet about the number of passengers for the Aranui 5 but the Aranui 3 holds a total of 198 passengers, with 178 in cabins and 20 in a dormitory. On our sailing there were 165 passengers, 25 of whom were Americans. There was a bridge tour available during our full day at sea. We learned about the name of the ship: ara means way/road and nui means big/high. Construction was started in 2011 and completed 18 months later. She was built in Romania and is the largest ship to be built on the Danube River in 200 years. 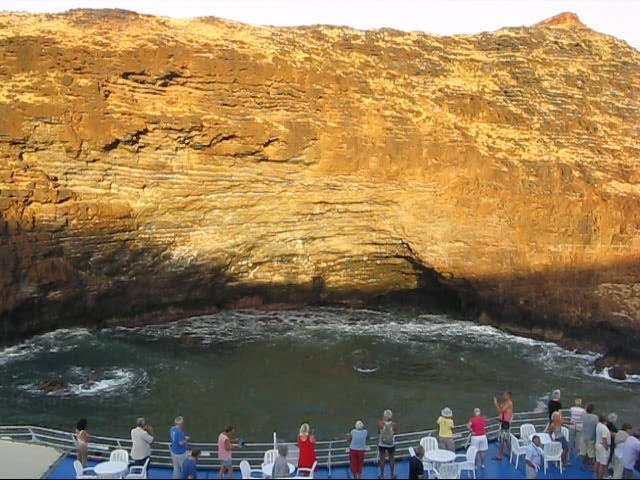 (Later in the cruise we had a slide presentation showing her construction and trip to Pape'ete.) Her maximum speed is 15 knots but usually cruises at 11 to 14 knots depending on winds and sea conditions. 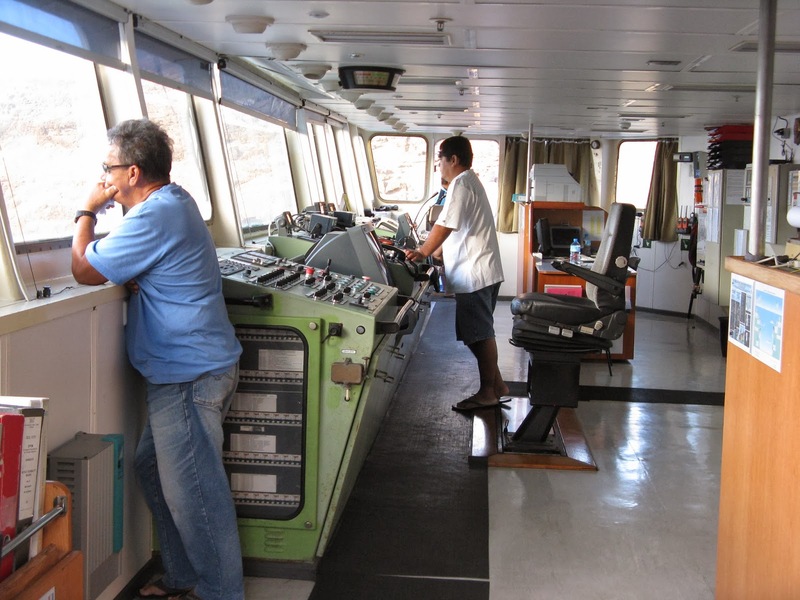 Most of the time the ship sails on auto pilot because this part of the ocean is very quiet and, while they may see a pleasure yacht or two, have only seen about 2 other ships in the 12 years the Aranui has been sailing. Overall the ship gross tonnage is about 7,500 ... a far cry from our next cruise which will be on a Holland America ship of about 60,000 gr tns and 1,300 passengers. The Aranui 3 also has freight capacity of 2,500 tons and two cranes, one a 35-ton crane and the other a 25-ton crane. As expected, the ship is far from fancy. Simple painted walls and metal handrails grace the inside of the ship. Instead of fancy works of art, the walls hold detailed information about the ship’s layout ... perfect for the onboard engineer. For the passenger, though, there was an easy to read ship layout chart on the Main deck. Our cabin was on the Main deck and we loved the location. It was close to reception and to the gangways. The layout of the cabin was as expected except it had a lot more storage than I anticipated. It had a safe in the closet which we didn’t use because we weren’t happy about the way it was (or wasn’t) working. Other pax also did not use their safe and, to the best of our knowledge, no one had a problem with anything being stolen. Left half of dining room .. duplicate on the other side of the room. One level up was the restaurant. Two levels up was the pool and one of the open sun decks. Small pool but very nice and it was used often. 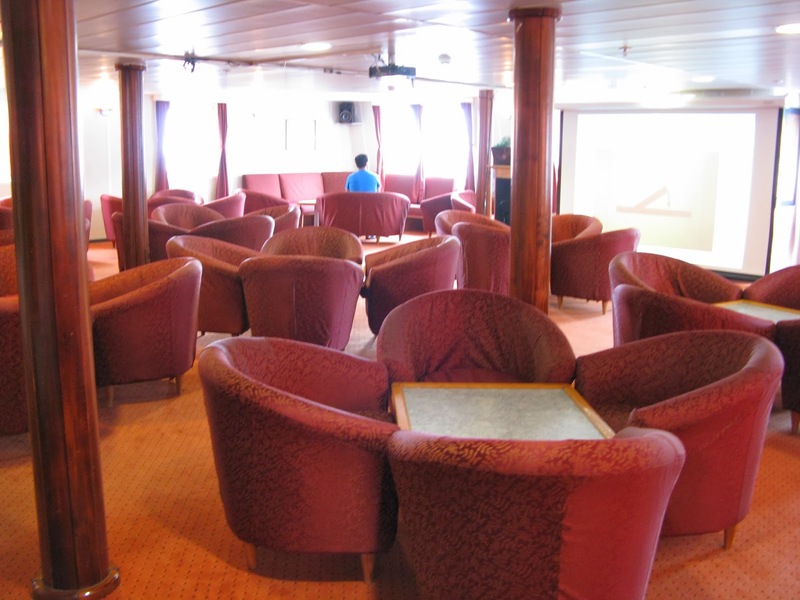 On the same deck as the pool was the lounge where our meetings and lectures were held. Coffee, tea and hot chocolate were available here around the clock. There was also a bar here with limited hours. Off to the side was a small room with a very nice library of books left by passengers. (Books on topic - the islands, the people, etc. - were at reception and needed to be checked out.) Also in the library were two computers for passengers to use when Internet service was available. Cost was 5 Euros per hour and pax could sign up and use their own wireless device. There were two passengers decks below ours - Decks A and B - with cabins similar to ours plus the dormitory. B deck had the passenger self-service (not free) laundry room and the gym. Free guest laundry was available three times during the cruise. Pax would put their laundry in a mesh bag (no socks or underwear) and several bags would be washed together in the large machine used for towels and linens, with clothes dried, folded and returned to the cabin. We used the service only once on a really dirty (mud!) pair of Jerry's pants that I was unable to get clean by hand washing. The pants came back significantly improved. Above the pool deck was another area for sun and sitting plus a bar. 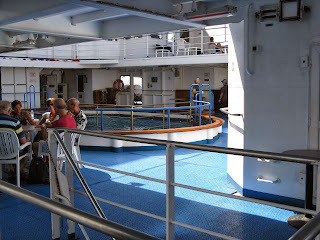 Topside was the Navigation Deck with the bridge. Our domestic flight was with United. Having originally booked a 4 pm flight out of LAX on Air Tahiti Nui, we had booked an early morning flight on United, leaving us enough time to meet up with LA friends for lunch and return to the terminal. 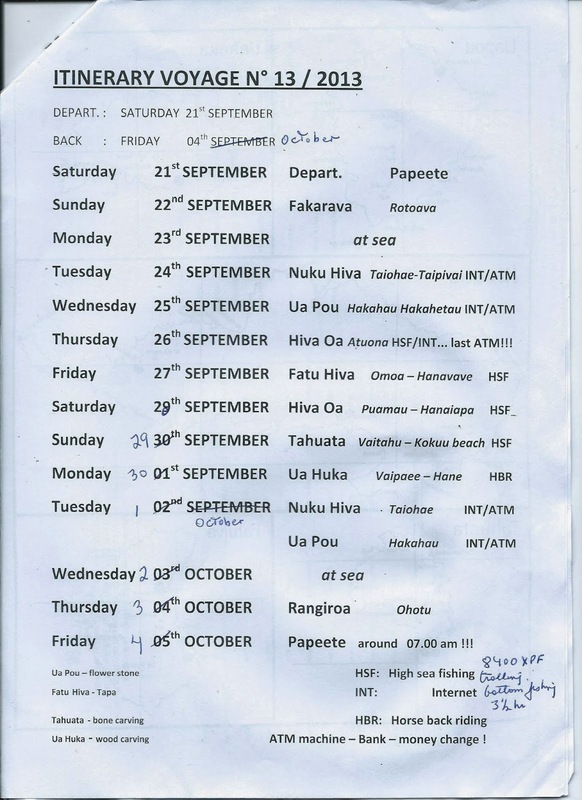 Email from Air Tahiti Nui several weeks previous informed us that our 4 pm flight was cancelled and we were booked on its 11 pm flight. Seven extra hours in the international terminal at LAX! Not fun! With the agent counters not opening until about 3 hours before flight time, all we could do was sit around in the restaurant area with everyone else who was waiting to check in. Traveling with only carry ons (two rolling bags and two backpacks), both of our small rolling bags were weighed by Air Tahiti Nui. (Our backpacks were totally ignored.) They were over the 10 kilo limit for carry ons (about 25 lbs each) and we had to check them. :( While the seats were short on cushioning, we had lots of leg room. Dinner was not great and the warm cabin didn't help with sleeping. Breakfast was a crepe with fresh fruit and yogurt and was pretty decent. Arrival was on time and we were quickly through immigration and customs. And (small world story) the first American couple we struck up a conversation with live about 60 miles from us in upstate New York! In the meantime, I went to an ATM to get French Polynesian Francs. Request for 20,000 CFP got me (2) 10K bills. I wasn't happy as I figured they'd be hard to break. How wrong I was! 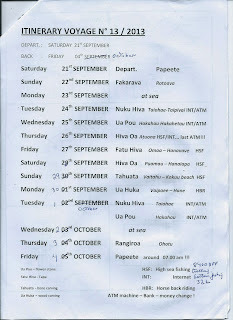 Pape'ete is so expensive that it didn't take long to have occasions to break both bills. And shortly thereafter require another trip to the ATM. Fare Suisse is a guesthouse. As I look back on the web site, the photos on site are not up to date. 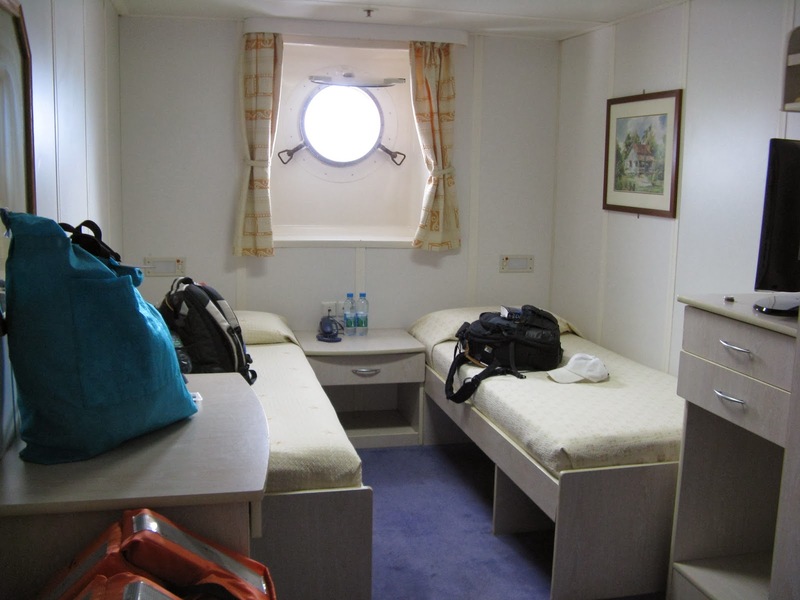 That said, while amenities were at a minimum (no shampoo), our pre-cruise and post-cruise rooms were clean and comfortable. Staff was friendly and helpful. There is a kitchen (which can use an upgrade) available for guest use. And it can definitely use a microwave ... it was not easy using the stove and oven. A continental breakfast is available for 10 Euros per person. Our first morning we passed on it as we headed out to find a small patisserie for breakfast, guessing we could find something less expensive. WRONG! After an exorbitantly priced breakfast of eggs, fruit and coffee at a not too nearby coffee shop, we decided to take advantage of the continental breakfast for the remainder of our stay. It consisted of juice, coffee, fruit, ham, cold cereal, cheese, butter, jam and fresh French bread. For us, it was worth the convenience. For lunch, we hit the nearby supermarket on our way back from our morning wandering around Pape'ete and picked up excellent french bread, cheese and juice. Looking at prices in the supermarket made it clear why restaurant prices are so expensive. Of course, everything has to be imported. Same brand of orange juice that I buy on sale at home for $2.50 was about $8 in the market. Still, the convenient supermarket made it easy for us to grab lunch Thursday and Friday and then for dinner after our return from our cruise. Our first afternoon (Thursday) was spent trying to recuperate from 30 hours of travel time. 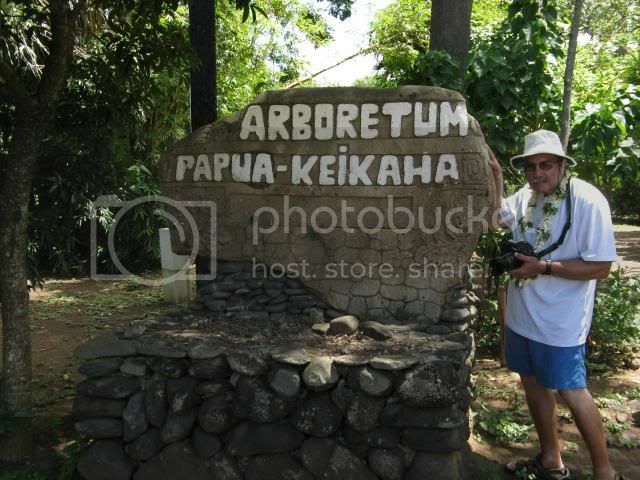 In the evening, we headed into the center of Pape'ete, a 15 to 20 minute walk. Everything was closed including the tourist office and souvenir shops. The only businesses open were restaurants. 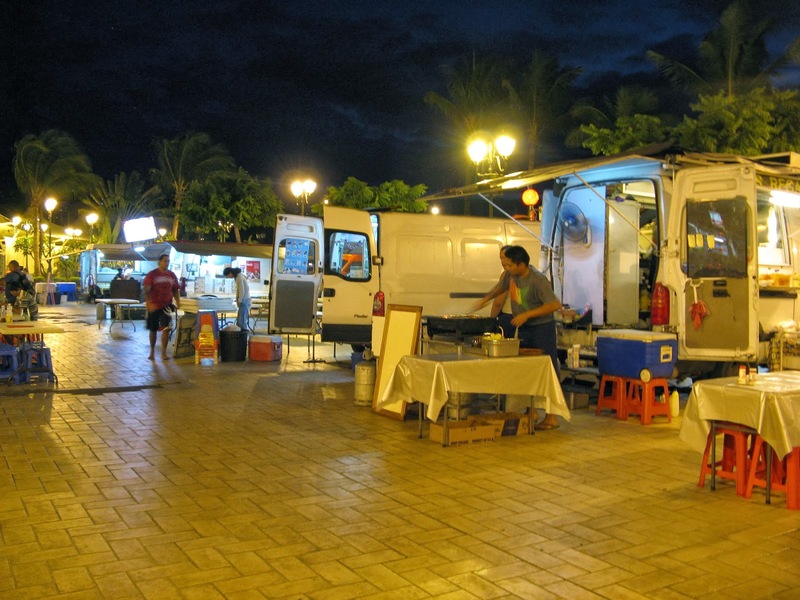 Our plan was to eat dinner at Le Roulottes, the food trucks that set up every night in a parking lot near the water's edge. Jerry had chicken curry. I had a beef brochette. Both were excellent and with bread and our large bottle of soda, the meal came to about $30 ... cheap by Tahitian standards. Afterwards, we strolled along the waterfront looking at some of the interesting boats anchored in the harbour. 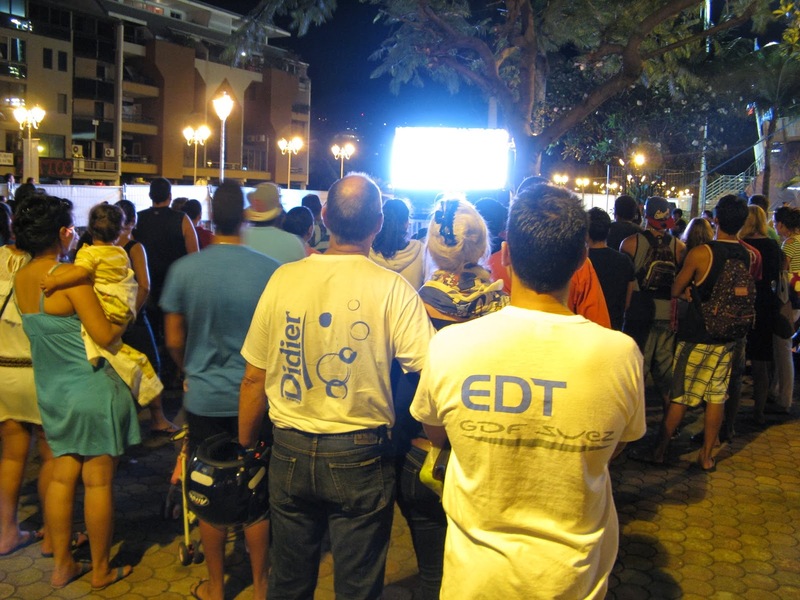 We had learned that afternoon that the 2013 Beach Soccer World Championships was being held in Tahiti, in a park three blocks from our guesthouse. 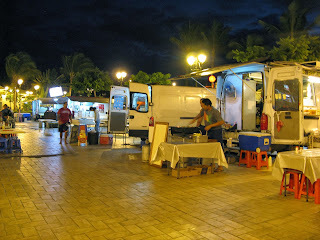 It was a nice distraction where we finished our evening with a cappuccino and fantastic chocolate crepes for dessert. Friday morning dawned raining. It delayed us just a bit and then we headed out to find the Le Marche, the central market. I have to admit I was a bit disappointed as everyone was selling the same souvenirs where I had hoped to find large displays of various local produce, fish and meats. While there was some of that, it wasn't enough to keep us interested for long and the pushy vendors only helped expedite our exit. I didn't even take any pictures. We wandered a bit, did some shopping in one of the nearby shops, visited the shopping mall (with mostly closed storefronts) to stop at the Internet cafe. Then we worked our way back to the supermarket, bought lunch to eat at Fare Suisse and spent the rest of the afternoon escaping from the heat in our air conditioned room. Late Friday afternoon we walked back to the park to browse an artisan show and tripped over a local fashion show which was kind of neat. That evening we had more exposure to beach soccer (stadium tickets sold out but we could watch it on the big outside screen). After dinner at one of the cafes in the park, it was time to call it a day. 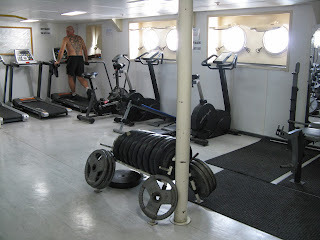 This trip fulfilled two items that have been on my wish list for a long time: freighter travel and the South Pacific. 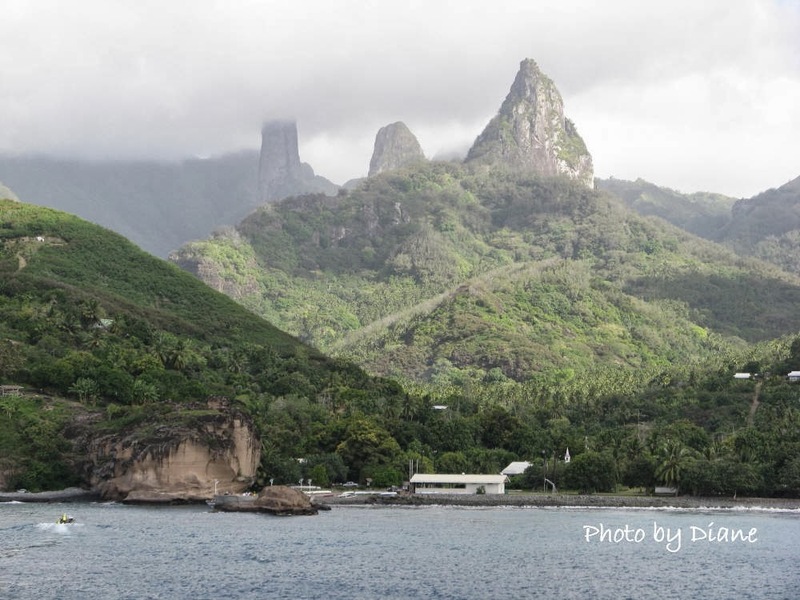 We flew to Pape'ete Tahiti where, after a few days to adjust to the time zone, we boarded the Aranui 3 for one of its two week sailings to the Marquesa Islands. As you can see from the map below, the islands are pretty much out in the middle of nowhere. 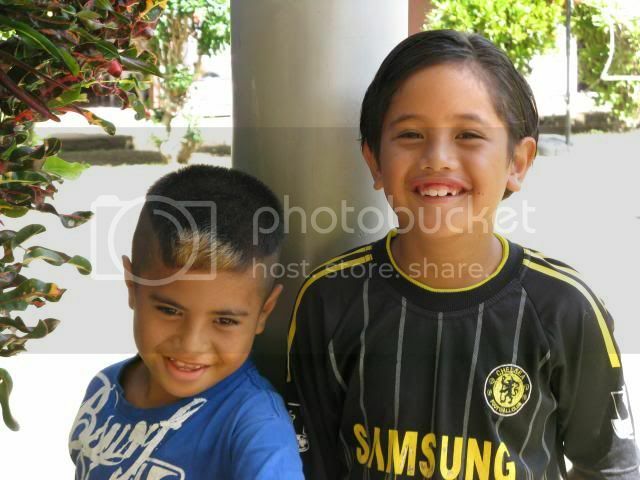 They are approximately 1000 miles from the island of Tahiti and they are the furthest land mass from any continent than any other land mass in the world. Over the next few days I'm going to start organizing my travel posts. 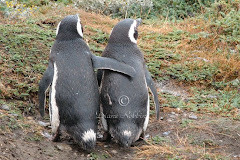 I also need to get through my pictures as I do want to include some in the posts. So stay tuned for more. New Post Going Up on Travel Ideas. Travel Tips. Travel Warnings. If you haven't already, please subscribe to my other blog Travel Ideas. Travel Tips. Travel Warnings. Just uploaded a new post and am in the processes of getting a bunch of new ideas, tips and warnings ready to upload over the next couple of days. Viking River Cruises, known for its river cruise-tours in Europe, Asia and Egypt, announced on May 17 that it is launching an ocean cruise line, Viking Ocean Cruises. Viking placed orders for two 928-pax ships, with options for more. The first, Viking Star, is scheduled to begin sailing in May 2015, with itineraries to Scandinavia, the Baltic Sea and the Western and Eastern Mediterranean area. The mid-size ship will be designed to have access to most ports. I have sailed Viking River cruises in China and in the Netherlands and am looking forward to a seagoing experience with them. Anyone else interested? Was speaking with a friend who was taking an international trip. She mentioned getting her Euros at Chase and I asked her about fees. She said there were none. Chase doesn't charge a fee if you do business with them. She doesn't have any bank accounts with them but has a Chase credit card.That was all she needed to get her Euros with no extra fees. I am anticipating needing Euros in the near future and was going to head over to AAA. Now I'll first check things out. Very convenient that there is a Chase branch right across the street from our AAA branch. When you’re planning an extended family vacation, a rental property is often more economical and more convenient than a long stay in cramped hotel quarters. Selecting the perfect short-term vacation rental, however, is far from a simple process if you’re not sure what you’re looking for. When you’re adequately prepared and have a firm idea of your needs in mind, however, finding the perfect vacation home is far from daunting. Armed with the items detailed on this list, you’ll have a strong vision of what you need from a vacation home and amenities to be on the lookout for as you browse through rental listings. A Functional Kitchen – One of the primary amenities of a vacation home over a hotel room is the ability to prepare meals at your home away from home, rather than springing for restaurant meals at tourist-destination prices. Make sure that you’re taking the functionality of the kitchen into account when you book your rental; a hotplate and a dorm-sized refrigerator in a garage apartment won’t be worth the money saved on the rental when you’re forced to drop a bundle on three meals out each day. Smoke and Pet Free Houses – Smoke and pet dander not only leave unpleasant smells that linger for weeks, they can also be triggers for family members that are prone to allergies. 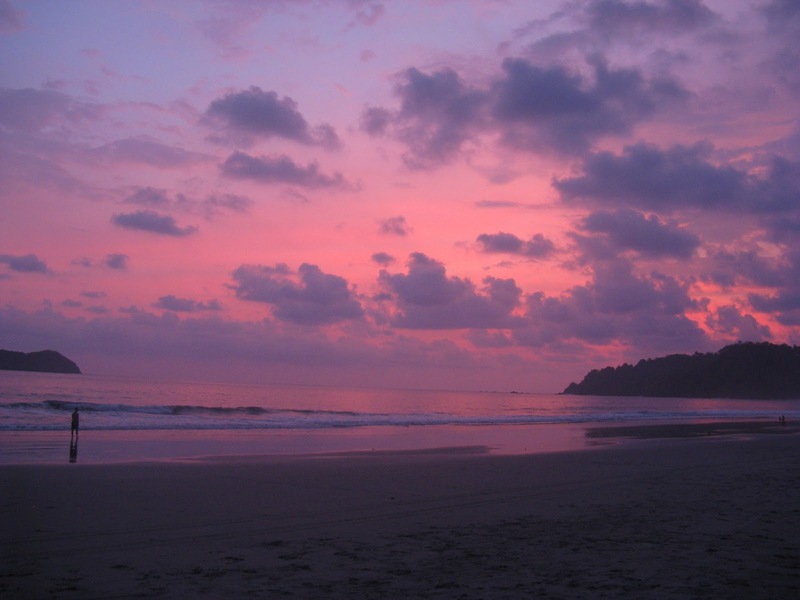 Make sure that you’re keeping an eye out for smoke-free, pet-free vacation rentals. Unless, of course, you plan to bring Rover along for the ride. Ample Sleeping Space – Vacation home owners know that the appeal of a rental over hotel accommodations is that they can reasonably house more people than a hotel room and, as such, can prove to be a more economical choice for large groups. Your teenager will get tired of sleeping on the pull-out sofa in a main area, though, so make sure that there’s enough privacy to go around. And if you don’t feel like lugging along the portable crib, be sure to inquire as to if you can get one on location. Multiple Bathrooms – Unless you’re traveling as a single family and are accustomed to sharing a restroom, it’s a good idea to look only at listings that include more than one bathroom. Waiting in line for a shared, single restroom is enough to rain on anyone’s parade, and will make for hectic morning ablutions. Full-Sized Bathtubs – In order to maximize available living space, many vacation rental owners opt to build smaller bathrooms with only a standing shower. This might not be an issue if your kids are older, but bathing a frightened toddler in a standing shower is no one’s idea of a good time. Dining Space – Those home-cooked meals that are going to save you big bucks aren’t as much fun when half of your group is balancing plates on their knees on the back porch. Make sure that there’s seating for everyone in your group, or you won’t be sharing many family meals while you’re traveling. Close Proximity to Area Attractions – In an unfamiliar area, the last thing you’ll want to do is navigate a maze of back roads and residential streets to find the beach or the amusement park. A centrally-located, easy-to-find home is your best bet when you’re visiting a new town. Safety and Security Features – Pools are an attractive amenity for travelers, but can pose a hazard for families with little ones that aren’t yet strong swimmers if the proper safety features aren’t in place. Modern furniture with glass tops and sharp corners also aren’t safe for little ones that aren’t steady on their feet. A place that offers childproofing or at least safety gates can be helpful. Keep an eye on safety while you’re looking for a vacation rental so that your trip isn’t spoiled by a trip to the emergency room. 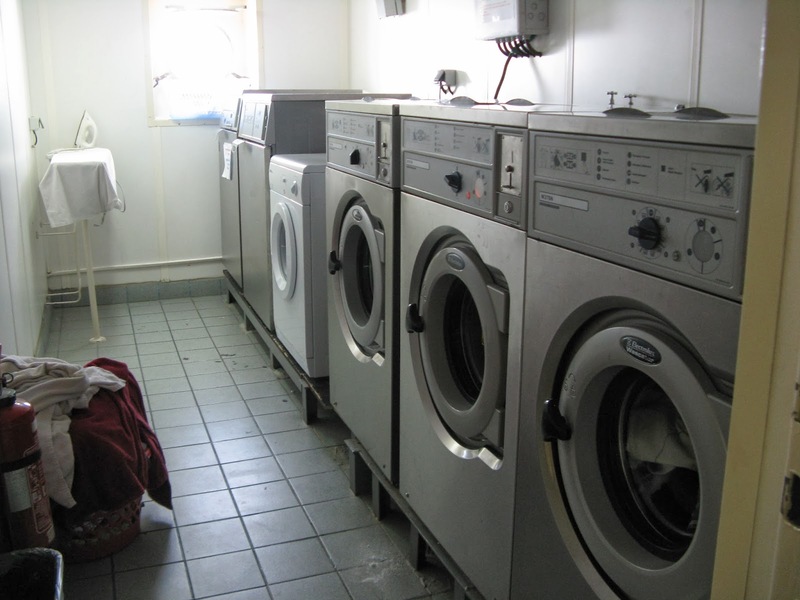 Laundry Facilities – You won’t want to deal with enough luggage to keep your entire family in clean clothes for the duration of the trip, and you probably won’t like the idea of spending your vacation in a Laundromat much more. 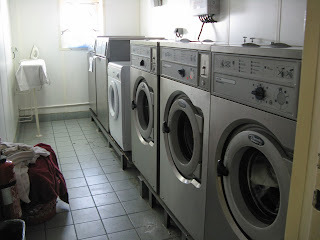 Homes with on-site laundry facilities should probably take precedence over those without them. Access to Childcare Services – One perk that the major resort chains have over small, owner-operated vacation rentals is that those big-box resorts typically have childcare services on-site or a concierge that can direct you to a reputable service. Unless you plan to never have a grown-ups night out, you’ll want to inquire about childcare services and temporary nanny agencies in the area, or line up a local sitter. Not only should you be aware of the add-on fees but based on the experience of my travel agent, don't expect your experience to be anything like you would find on an airline here in the U.S. She had the "opportunity" to fly Vueling airlines and now calls it "grueling" airlines. I, for one, can vouch for the amount of preparation a vacation takes, from researching the destination to researching tour operators and finally making final itinerary decisions ... which for some reason don't always stay final. But that's another story. This post is about preparing your house for your vacation. We have our own checklist that has evolved over time. The following is a bit more general and will apply, in most cases, whether you are going away for a few days or a few months. If you'll be gone during the summer months, raise the house temperature to 78 degrees. Every degree you raise the thermostat will save you about 2 percent on your heating costs. If you have a pool, continue to run it so the pool doesn't develop algae and turn green. Check the settings to make sure they are where you want them. If you'll be gone long-term, ask a friend or neighbor to stop by and monitor things. If you have a spa, you can turn off the heat. Turn off water at the main shut-off valve unless you've got household items that require water on a regular basis such as an automatic sprinkler system. If you'll be gone more than a month, as a friend or neighbor to turn on the water and run the faucets at least once a month. This helps prevent sewer gas from etering the house and can keep parts of plumbing fixtures from drying out. If your water heater has a "vacation mode" setting, use it. Pour a half cup of chlorine into the bowl to reduce bacteria which can cause stains. Put inside lights on variable timers. Throw out perishables (or pass along) like milk which may expire while you are gone. If you will be absent for along time, generally clean out the refrigerator. If you'll be leaving it running while away, fill it with bottles of water so it will run more efficiently.